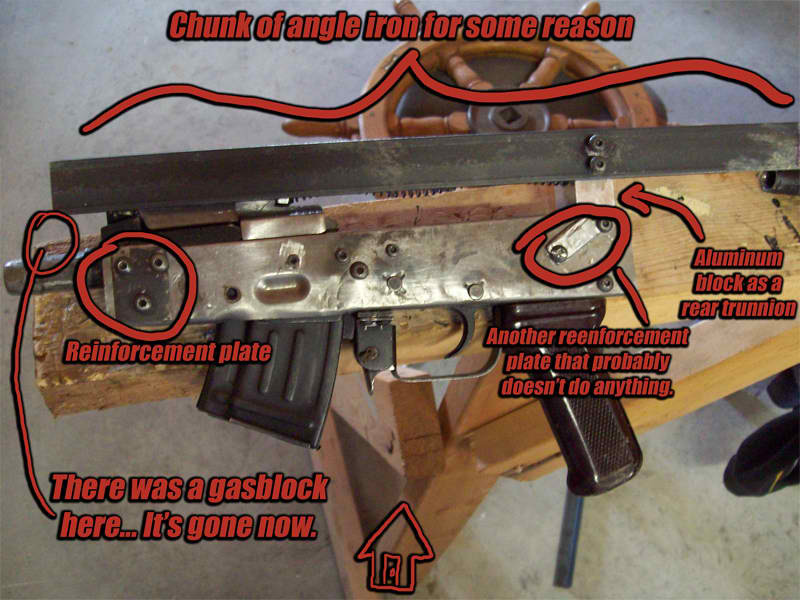 I had an AMD-65 trunnion with a barrel stub on it that I couldn't remove that came in with a parts kit. 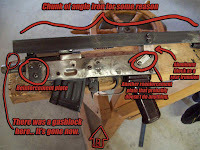 The parts kits are gone now, but you can still pick up an AMD-65 Trunnion with barrel stubs attached at APEXGUNPARTS. They have about 1-2 inches of rifling. 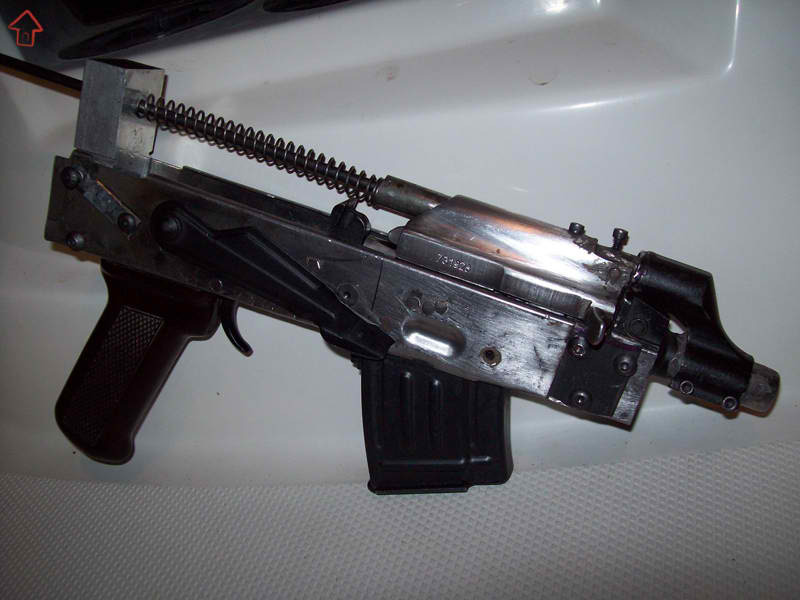 A few people have successfully built "guiderod pistols" which are just AKs with a really shortened gas piston. 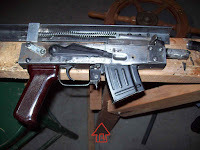 They require you to re-attach the piston to the carrier and turn down the barrel to fit the gas block. Additionally, you must drill a hole through the piston to accommodate the guiderod (which can be a steel rod or in my case, a chunk of cleaning rod) so that it guides the carrier straight. I couldn't get the damn bits to drill through the hardened piston, so I went the lazy route and installed it from the back. It needed a new rear trunnion or something because there's now a spiky rod shooting towards your face when you rack the bolt. I added 'reinforcement' plates to the front trunnion because the screws weren't getting enough threads into the trunnion (I wasn't sure if I drilled deep enough). 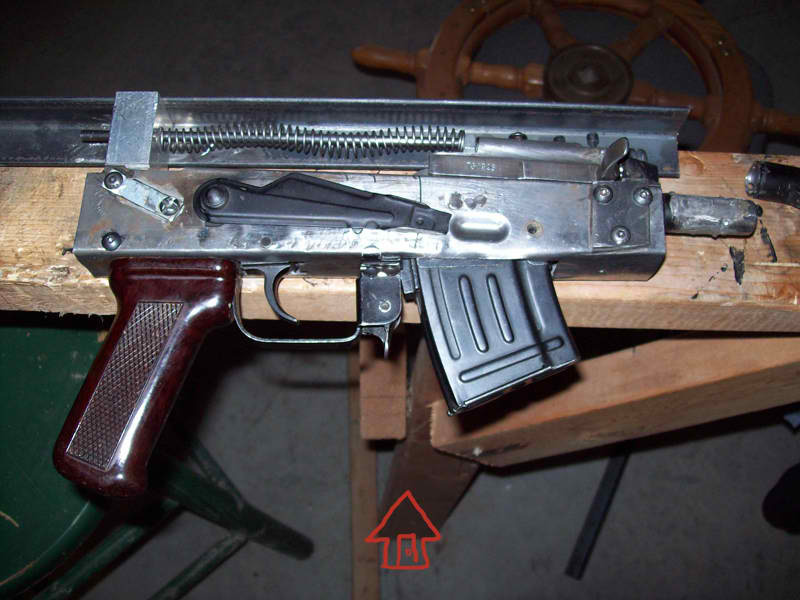 This way, I believe the bottom hole (which is screwed in place with a support pillar) absorbs the extra recoil and puts less stress on the top screws. The back support plates don't really do nothin'. There's a support pillar in there too. The rear trunnion is a hunk of spare aluminum block I had lying around. There were a few reasons for the angle iron. One was to have a base for adding of a rail. Second was to put downward pressure on the bolt because the magazine kept putting upward pressure and not making things smooth. Third, to act as a top cover. I fired the first three shots by remote (aka kite string) using Wolf 123 gr steelcased ammo. The piston didn't cycle at all. I decided to open the gas port to .19". I figured that removing material from the barrel didn't affect the chamber integrity and there was no chance of a kaboom, so I decided to test fire it myself. I used downloaded ammo but it didn't cycle. I then switched to Wolf and the gas block went flying down range about 10 yards on the first shot. The fireball from the shot was pretty intense, like openening a 300 degree oven. The gas block was just a standard gasblock with out-of-spec hole placement that I split the bottom open with a dremmel and forced it in on the barrel. I tapped the holes for 6-32 screws and screwed them in tight until both sides met. I wonder if I would have had better luck with DEZArms adjustable Gasblock or if I would have ended up with the same results. I don't wanna put any money into this though. I decided to scrap it after that. The receiver is still good, it just has a few extra trunnion holes (and a little crooked, as usual). I think the barrel is still good for something. I'm thinking maybe I can put a steel sleeve over it to extend it a little so I can add a gas block to act as a REAL guide which I can also attach a California-style pump mechanism and have a pump-action pistol. The whole thing was NOT a dream.